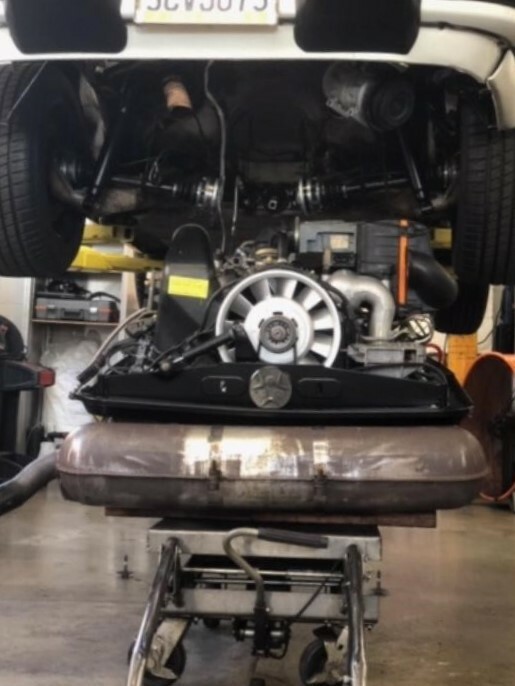 Well, work continues on my complete bottom up engine rebuild on the 1988 911 3.2 Carrera Cab. Here's a pick of the new axle boot rebuild, new shocks, clutch slave and hard line. Keep finding little things to tidy up as we go on my new to me 155k two owner CA Cab. Clutch Slave/satellite was weeping and hose bubble added to little things as we get closer to install of new engine. Hold up now is SuperTec head studs on back order. I'm told we should have them this week. After inventory of parts we believe this is the last of the parts to complete the top end. Last edited by 996AE; 01-23-2019 at 08:06 AM.. Huge shout out to *************** a u t o haus AZ (pelican deleted full name. Great prices on Porsche OE and OEM parts and service is outstanding. If they dont have it ive been using Sonnen. Both have been outstanding to work with. I am told my Supertec head studs are on the truck and scheduled to be delivered today! Pictures of top end assembly to follow. Engine P&Cs and reworked heads back on, valves adjusted ready for final assembly. Last edited by 996AE; 01-24-2019 at 12:27 PM..
Plan is to fire her up tomorrow. Waiting on injectors and flywheel resurface today. 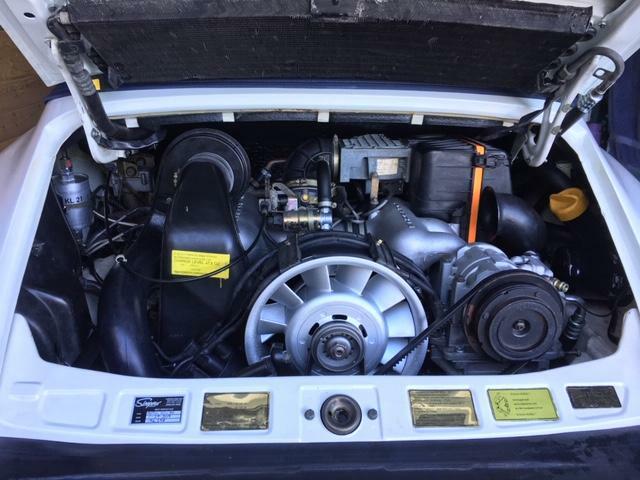 Well the 4-6 week top engine build turned into a 4 month full refresh of my 155k mi 1988 3.2 Carrera. Bottom end opened up (why not were this far) so off we went. Polished and balanced crank, rebuilt oil pump, new bearings, gears and chains, reseal, new P&Cs, supertec head studs, rod bolts, etc... etc... Heads reworked, the list goes on. Heading over to Sleepers this morning to hear the first start of my engine. P U Car tomorrow. Test drive done by shop. 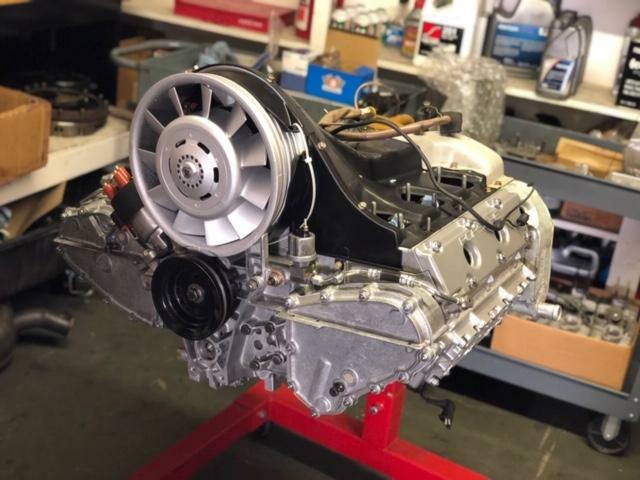 First thing tomorrow morning will drive from Costa Mesa Sleepers Speed Shop to Westend to visit with Darin and Chris for corner balance and alignment. Excited to drive her again after the 4 month 20k refresh. Congratulations and looking forward to hearing how it felt to drive it after 4 months and a rebuild. 60 miles today. This after SSS did the inital break-in. Ran through the break in routine. Smooth, quite, super nice throttle response. No real feel for power at 4k tops for a 100 miles or so. Lots of compression braking and no freeway cruising. Passed smog with flying colors today with the Magnaflow weld in CArb CAT. At 500 miles break in oil out, value check, test pipe and Steve Wong chip. As long as SSS approves of course. Francis is a solid engine builder and a great guy. 1988 911 has to be one of the best daily drivers out there. 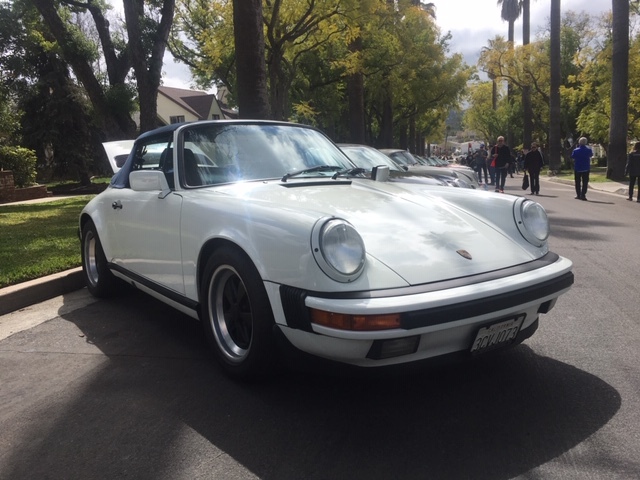 I factory spec'd and ordered a 1988 911 Carrera back in the day, and took European delivery 30 years ago. It was a coupe and this is a cab. Nice to add this to my small, but growing fleet of P cars. Westend (Darin) couldnt get me in until next week. Corner balance, four wheel alignment and new front inserts will complete suspension refresh. In less Darin finds something I havent seen. Ride height is currently set at 25 1/2 all four corners. Going to go Euro spec after new front strut cartridge installed. 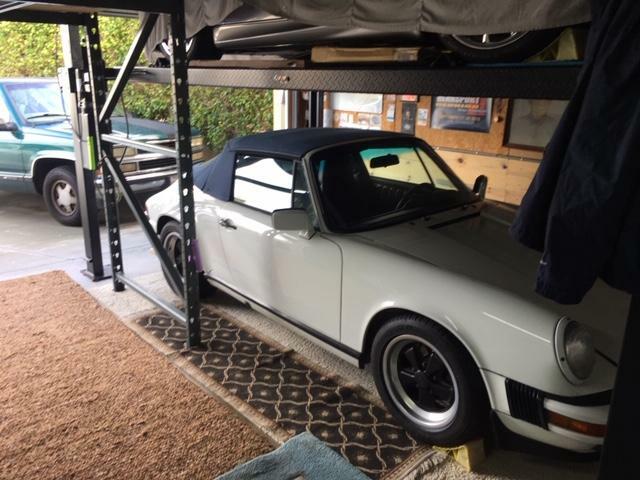 Last edited by 996AE; 02-02-2019 at 06:13 PM..
Just finished a long day of garage therapy. SoCal rainy day so it was garage time. Several Porsche events around town, first Saturday kinda things but didnt feel like getting wet. So, spent the day pulling all the 30 year old carpet out of the car and steam cleaning and reinstalling. Amazing what a little deep carpet cleaning can do to a 30 year old car. I was going to post a picture but it wouldnt do it any justice. Well, rain stopped and this morning added some break in miles. Over 120 now. Only issue is a hanging idle. Drops nicely to 1100 and sometimes wont idle down, other times blip and she settles down to 970. I'll have SSS check it out at the 500 mi valve check and oil change. Westend Gardena CA (Darin) confirmed alignment, corner balance and and Euro ride height is a go for tomorrow. Darin went over the car and did his usual fantastic job. Drives like it should now. Next upgrade is turbo tie rods. New rear shocks and front inserts done along with sway bar bushings, Euro ride height and street alignment. Cant say enough about the PS2s on this car. Amazing combination when done right. 250 miles now on break in. Still under 4600 RPM. 5k according to SSS engine builder but I am still working my way up the RPM ladder. Last edited by 996AE; 02-07-2019 at 02:32 PM.. Rain has kept the fresh 88 Cab in the garage this week so no new miles added. This morning is dry and sun is out so she will get a little more time. Picked up new Beru spark plug wires, test pipe and SS sport muffler to go with Steve Wong chip. SSS said to wait for 500 mile valve check, oil change break in miles before adding free flowing exhaust mods and chip. 350 miles and car is running like it should. 4600 RPM tops so far, warm ups and cool downs with lots of compression braking. After oil change and valve check I will find out how she really runs. That's a lot of break-in miles! You've far more patient than most. Glad she's running well. But my 12 mo 12k mile warranty from engine builder requires this approach. Next week she goes in for AC check up and estimate to get it working again. Hopefully not a big bill. A run to Sierra Madre Collection open house and back hit 499 on the clock. Tuesday she goes in for her 500 mi valve check, oil change and overall check up. For a few that have asked here is the breakdown on my new to me 155k mi CA car I bought for 20k knowing it needed a top end. Two prior owners clean car fax, service and books and records. Not including cost to acquire car, tax and fees of course. Last few items needing attention AC and Cruise control. Last edited by 996AE; 03-06-2019 at 09:24 AM..
Well, add 720.00 to the build cost. I learned today thats my cost for mandatory post build valve check and oil.filter service. SSS does give a 12mo 12k mi engine warranty so I guess its all good. P U car with fresh oil, valve check and green light to find red line. Steve Wong chip, test pipe and sport muffler next. Cruise control working, although I cant see ever using it. Motul oil is Sleepers Speed Shop oil of choice for my new 3.2 engine. Last edited by 996AE; 03-06-2019 at 09:23 AM..